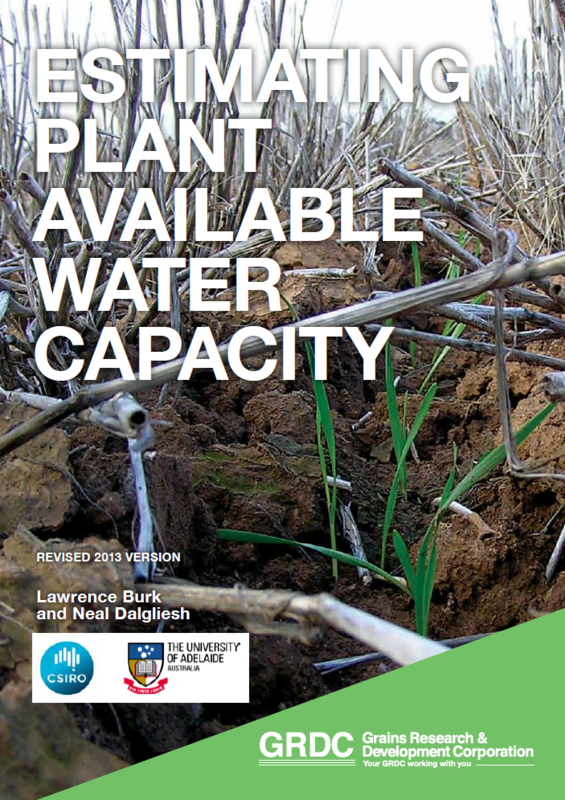 This manual provides consultants and advisers with practical information, methods and tools for the characterisation of soils for plant available water capacity, with the aim being to ensure improved consistency of measurement and delivery of information to the Australian agricultural sector. Characterisation provides a way for the grower, consultant or researcher to gain a better understanding of the size of the soil ‘bucket’ in which the water resources required to grow a particular crop are stored. This information can be used in a number of ways: to add to farmers’ intuitive knowledge (‘gut feel’); to develop better rules-of-thumb for managing resources in a more informed way; and as a critical basic input to simulation modelling using tools such as APSIM and Yield Prophet®, which allow exploration of crop management issues in real time. Soil characterisation is the determination of the PAWC of the soil at a particular point in the landscape. Generally the site is selected to represent a much broader section of the landscape that is considered as either being of a similar ‘soil type’ or representing associations of soils with similar characteristics. Characterisation is about defining the ability of a soil to hold water for the use of a particular crop, known as the soil water ‘bucket’. It is different from soil monitoring, which is about measuring the quantity of water in the soil bucket at a certain time. bulk density (BD) – the density of the soil, which is required to convert measurements of gravimetric water content to volumetric. As well as measuring soil physical characteristics, collecting soil chemical data can provide information about the potential for subsoil constraints to affect a soil’s ability to store water, or the plant’s ability to extract water from the soil. Use https://grdc.com.au/GRDC-Booklet-PlantAvailableWater to ensure your link remains current and up-to-date!